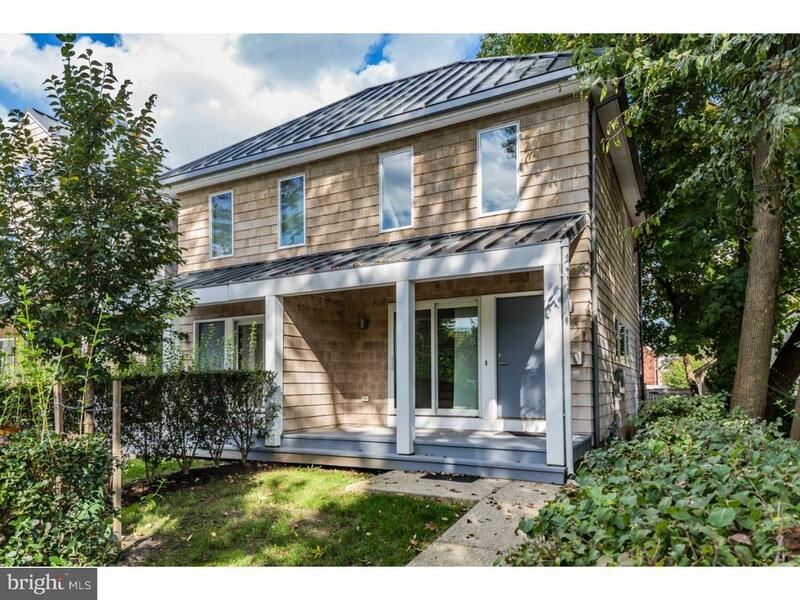 Designed by J. Robert Hillier, this is one of seven exciting contemporary condominiums in an enclave off historic Greenview Avenue in Princeton. Originally built in 1910, this duplex has been transformed and expanded from its foundation to the third living level. Clean, cool spaces, bathed in natural light and sheathed in natural materials such as bamboo flooring and granite countertops are all hallmarks of Hilliers green designs. This delightful four level condominium features an open floor plan with the living and dining rooms flowing into the maple and stainless steel kitchen with impressive granite breakfast bar. At the back of the home is a study or breakfast room and a half bath. The second level includes two bedroom suites with gleaming white tiled baths with frameless glass showers. From the master is a staircase leading to the large third level loft or office with sliding glass doors to a private rooftop terrace providing wonderful framed views of the surrounding neighborhood. On the lower level is a finished game or exercise room. Two designated parking spaces serve this condominium.